Basing the narrative of a story around a gimmick can be a risky proposition. In the best cases, a well-timed twist or a key plot element can lift an otherwise pedestrian story into something memorable and beloved. But in the worst cases, reliance on a gimmick can expose the plot“s lack of depth and character, leaving it as a cautionary tale. The new Compile Heart RPG Dark Rose Valkyrie strives to live off of its own memorable gimmick, but is the game strong enough to support it? Dark Rose Valkyrie is set in an alternate history version of Japan where Earth has become overrun by victims of the Chimera Virus; a mysterious disease that twists and corrupts people and animals into monsters. The lead character Asahi is an inexperienced young officer assigned to lead an experimental squadron equipped to take on the Chimera in battle, but when he and his team aren“t out in the field fighting, Asahi has to spend time with his squad members in order to build their trust in him and help them out. 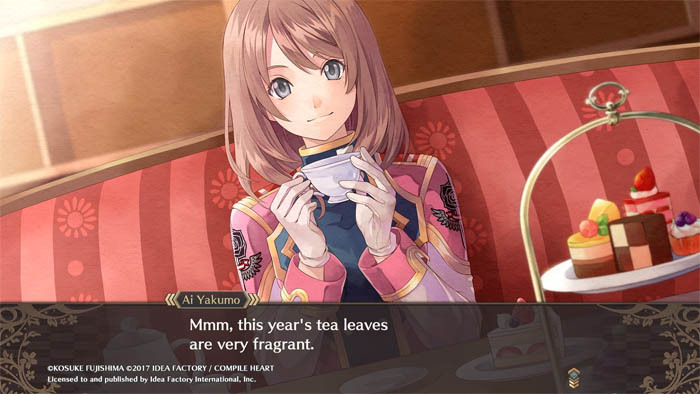 In terms of its basic structure, Dark Rose Valkyrie isn“t too unlike other JRPGs that have blended dungeon exploration and combat with social elements. There“s a clear divide between embarking on missions that take the player out onto the world map and in dungeons to fight Chimera, and more quiet one-on-one interactions between Asahi and the members of his team back at the Command HQ. The social aspect, in which dialogue is handled in the manner of a visual novel, is loaded with entertaining writing, though Asahi“s squad mates are very heavily defined by predictable tropes. Unfortunately, the game falters elsewhere. 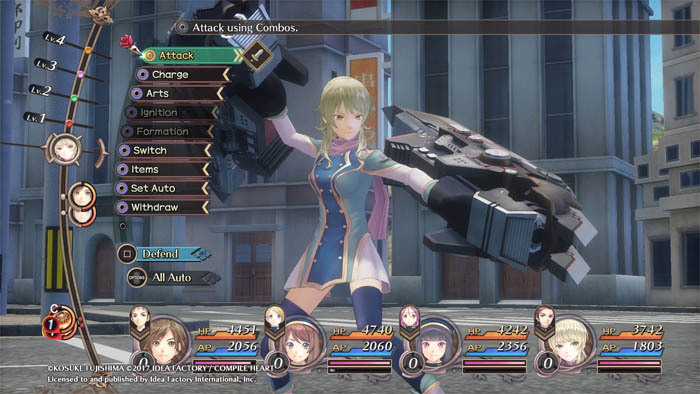 The combat system in Dark Rose Valkyrie attempts a degree of complexity that“s undercut by what could be best described as design bloat. The basic idea behind the combat system, which is turn-based and gives all party members various melee, ranged, and special art attacks, is interesting on paper, but for as many commands as the battle menu lists, a good chunk of them don“t feel necessary, if not useless. I stopped using the Charge command, the second command in the menu listed right under the basic â€œAttackâ€, because it did little to nothing any time I used it and the game was terrible at explaining its function. This bloat extends outside of battles, as well. The party members can all be outfitted with a wide range of equipment to boost their parameters, and unlocking new equipment in the shop requires the player retrieve items out in the field that can be used to make this new gear, in addition to spending money. But money is also required to repair and enhance the party“s outfits, which take battle damage and can be destroyed if the enemies deal enough damage. On top of this, money is also necessary to spend at the infirmary to help party members recover from fatigue that only accumulates when the Ignition command is used to enhance their power in battle. The design is certainly ambitious, and it“s not without its share of successes. But the volume of concepts that the game throws at the player, many of which I haven“t even begun to outline, make it feel as though the designers threw all of their ideas into a pot without being mindful of how well they would all mesh together. There are multiple levels of attack strength that determine how long it takes for an attack to trigger after selection, and each character has multiple basic attack combos under the Attack command to choose from with different properties. The reserve party members can jump in and deal damage as a team, or individual reserves can assist a specific character on offense or defense, but their participation is entirely random. Another point where the game falls short is in its side missions. While there is a decent variety in the types of missions available, the game does not do a good job of explaining where you need to go to complete them. A mission may require hunting a specific monster in a dungeon, but rather than mark that monster“s location on the minimap, the game“s only indication of where to find the creature is a small screenshot in the mission description. At one point, I wandered in circles for an hour trying to figure out where a particular Chimera I needed to hunt was without success, only to stumble across it when in a corner of the map. I might have given up on it had it not been one of the side missions required to progress the story. In the introduction, I alluded to the presence of a gimmick at the heart of the plot of Dark Rose Valkyrie. As the game“s marketing has made a point of this, it“s fair to at least provide this spoiler: One of Asahi“s party members will become a traitor. While such a plot twist isn“t novel in and of itself, it“s the manner in which the game handles this twist that stands out. The identity of the traitor is not a fixed point in the narrative. Different players will see a different character turn traitor, and while I“m not knowledgeable of all of the mechanisms in play that determine who, the game begins with a personality test that undoubtedly plays a role in this decision. Primary gimmick aside, the game“s presentation is kind of a mixed bag. The music is suitable, but doesn“t really stand out, and the dungeon and overworld environments feel simplistic and bland. On the other hand, the game“s character designs, created by manga illustrator and Tales of character designer Kousuke Fujishima, are excellent. And in lieu of traditional static character portraits, the game uses a technique that gives the portrait figures an eye-catching degree of animation. As much as I“d like to enjoy Dark Rose Valkyrie, it“s held back by obtuse and unnecessary mechanics and systems. My time with it has been a rollercoaster; there are high points, mostly in the social aspects, that I honestly like, but then the more frustrating aspects rear their head and the game becomes a slog. 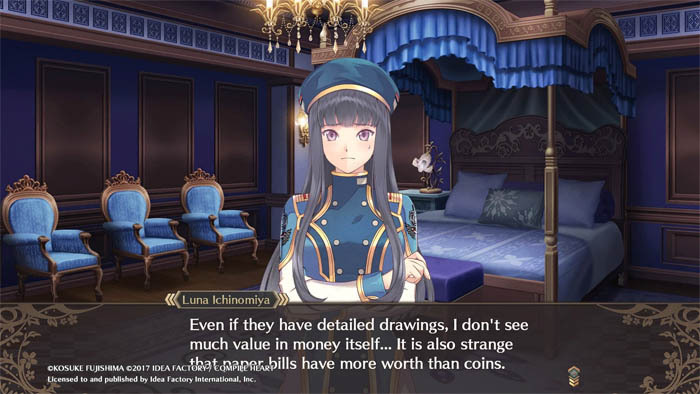 The game isn“t entirely without merit, and fans of Idea Factory games will probably get their money“s worth, but anyone looking for a more polished experience should look elsewhere. Fans of Idea Factory games will probably get their money“s worth, but anyone looking for a more polished experience should look elsewhere.